zorro-unmasked: DON'T JUST SHOUT "NO TO ISA". MEAN IT AND JOIN US. 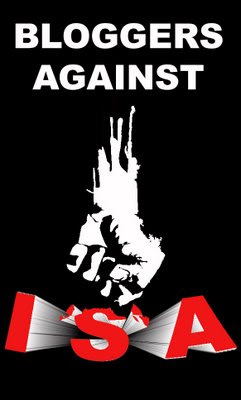 DON'T JUST SHOUT "NO TO ISA". MEAN IT AND JOIN US. It is an accepted fact that BLOGGERS played a significant and defining role during the run-up to the General Elections in March 2008. Blogging, its power and outreach were recognized such that post GE12, a plethora of politicians, who previously called us gobloks, stupid, monkeys, unemployed and liars, desperately and in fits, took to blogging. Blogging, for these mostly defeated politicians, became the flavor of the times. However, some fell on the wayside primarily because they hired stand-in bloggers, just like stuntmen and extras in filmdom. Government TV stations went to town with weekly invites to Bloggers. Threatened MSM agreed half-heartedly and came up with half-baked attempts.Such was the effect of blogging; although some believed that it would be the panacea to cure all the ills the BN government inflicted on us.Such was the seismic effect of blogging that the Government overeacted childishly and blocked blogsites and got caught with their pants down. Deep down, I believe that Bloggers are change agents. We can make things happen. We can make a difference for the betterment of this fair land. We are the Blue Ocean. I intend thus to use the potency of blogging to push for the total abolition of this most hated vehicle of evil that is the ISA. Enough has been written about it being the most effective weapon in the government's arsenal. Enough has been said about the Judiciary impotence against this dastardy piece of legislation. Not a single member of the Bench has that scrotal gumption to stand up to the Executive and said "Enough is Enough, this is against all decency.!" The above logo "Bloggers Against ISA", on request was designed by Bodohland. Join US. Email me at ktswee@hotmail.com with your blogname (URL) and put up this logo on your sidebar. It is a small effort but we have to take the first step. This article by GMI might prompt you to take that first step. Take it for a New Malaysia. We, the People, want it thrown away once and for all! October 27, 1987 marks 21 years since the infamous Operasi Lalang. The operation, which was carried out on 27 October 1987 by the Malaysian government to crack down on opposition leaders and social activists, saw the arrests of 106 persons under the Internal Security Act (ISA) and the revoking of the publishing licenses of two dailies, The Star and the Sin Chew Jit Poh and two weeklies, The Sunday Star and Watan. Today, the ISA is still being used extensively and threatened to be invoked to curb the activities and fundamental freedoms of political leaders, social activists, journalists, and more recently, bloggers. The arrests of Raja Petra Kamaruddin, Teresa Kok, Tan Hoon Cheng and most recently, Cheng Lee Whee under the ISA and a number of other incidents indicates that Prime Minister Abdullah Badawi, who pledged to use his remaining five months to reform the judiciary, the police and the ACA, will instead end up putting more people behind bars and further curbing fundamental civil liberties. Since Abdullah Badawi came to power in 2003, the ISA continued to be used in the same way his predecessors did, in the name of “national security”, often invoked upon people deemed to be critical of the government. The list of people detained under the ISA during the period of Abdullah Badawi’s premiership range from persons spreading rumours through SMS to political dissidents and alleged “terrorists.” In recent years, the government has created a climate of fear through the use of the ISA by threatening to invoke it upon bloggers who allegedly write inflammatory statements and upon those who participate in street demonstrations. This was stepped up in the run-up to the 2008 Election, and continues until now to prop up the ruling party’s weakened hold on power. The Abolish ISA Movement (Gerakan Mansuhkan ISA, GMI)’s monitoring reveals that there are currently 66 detainees in the Kamunting Detention Camp. 10 individuals have been arrested under the ISA from January until October. Three out of ten have been released after few hours or few days of detention (Teresa Kok, Tan Hoon Cheng and Cheng Lee Wee). Most of the detainees are alleged members of “religious extremist groups” including the Jemaah Islamiah (JI), while another significant number comprises those allegedly involved in counterfeiting currency or falsifying documents, Hindu Rights Action Force (HINDRAF) activists and also blogger Raja Petra Kamarudin. 6 detainees have been detained for more than 7 years under the ISA. To date, none of the detainees have been charged with any offence in an open court. More than half of them are into their second detention order and out of that number, 24 are serving their sixth or even seventh year in detention. We have a vast array of laws which provide an adequate legal framework to deal with alleged threats against national security without contravening universally accepted principles of justice and human rights. Why, therefore, is the ISA still used by the Malaysian government? GMI, in existence for more than seven years, has succeeded, through its many programmes, in raising public awareness about the injustice and cruelty of the ISA. It has also been able to put continuous pressure on the government by lobbying at home and abroad. As part of an intensive programme in conjunction with the seventh year of detention of a number of current detainees, GMI has produced several new books and pamphlets which have been distributed throughout the country. · To immediately and unconditionally release all persons presently detained without trial, and, where appropriate, to prosecute them in a public and fair trial. · To immediately repeal all laws which allow for detention without trial, such as the ISA, the Emergency Ordinance (EO) and the Dangerous Drugs (Special Preventive Measures) Act. · To immediately close all detention camps where detainees are held without trial. · To apologize to all detainees held without trial (past and present), and provide compensation for their suffering and anguish and the injustices perpetrated upon them. · To investigate all complaints and cases of victimization, torture, cruel, degrading and inhuman treatment, tyranny and abuse of power in relation to past and present detentions, and to prosecute the perpetrators including, but not limited to, establishing a Royal Commission of Inquiry for the said purpose. · To immediately debate SUHAKAM’s reports in Parliament and implement its recommendations. there....I have done in on my blog ! why should i shout and join you ?i dont know anyone in for ISA ! Up on my blog side bar and email sent. zeta jones, I really pity you and one day if someone you know is isa'ed, please do not come over and shout to us. The person maybe your family members or close friends, they can be lock up under the isa on the pretext that he/she needs police protection or a news reporter just quoted you wrongly. Yo Zeta Jones, best you don't contaminate the group with your attitude. Sleep well, but be assured that if you are treated unfairly, this group will come to your defence. Eugene.....go ahead, print and post as many to spread the message. Thanks. Shang....thanks you are first. I thought Che Det would be the first, as he recently said that RPK shouldn't be in Kamunting. Light Ipoh and burn the city hall guys .Make your mark ! Anyway, it's the message that counts right. I'll just put this up for solidarity sake a bit lower ok. I wanna make some personalised t-shirts - any idea where I can do that? Just wanna say this, i dont easily get irritated by bloggers.. but i am realising i begin to hate Rocky, Zorro. Maybe it's hate out of love. Still.. i feel like giving him a tight slap on his face. How can one changes just like that actually??? He's become so lowly, to the extend you can only laugh off reading what he writes.. sad.. sad.. sad.. I am really blessed to still have you, Anil, Haris, Susan and some of the rest just-minded bloggers. God i damn miss RPK I tell you!! PS: And dont you smoke and drink too much, gotta ensure your physical health is as good as how you're upkeeping your mental health, man! by the time you know someone is in for ISA. it be too late. Remember Hitler and Nazism? Zorro, see you this sunday. after dinner, be there with my family (of 4 including me) for the countdown. you and haris are exceptional. God bless you all. I'd rather scratch my balls and drink some green tea than commit myself to this cause. I cannot find Hitam Merah on your blogroll. It's a pleasure to be of service to you and to the blogging community. I am using WORDPRESS and I don't seem to be able to post any graphic or logo on my sidebar. Anyone out there who could help perhaps? Anyway, I am with you and the rest for this good cause. We all miss Raja Petra greatly.... dare we dream to have him back to our folds today after the Shah Alam's court ruling? That would really really really make our days wouldn't it? There seem to quite a few ball scratching scum who love to read your blog, huh? you guys need to get a life !take up some kinda sport. Abolish ISA for a vibrant Malaysia! let my (the) people GO ( FREE ) ! !